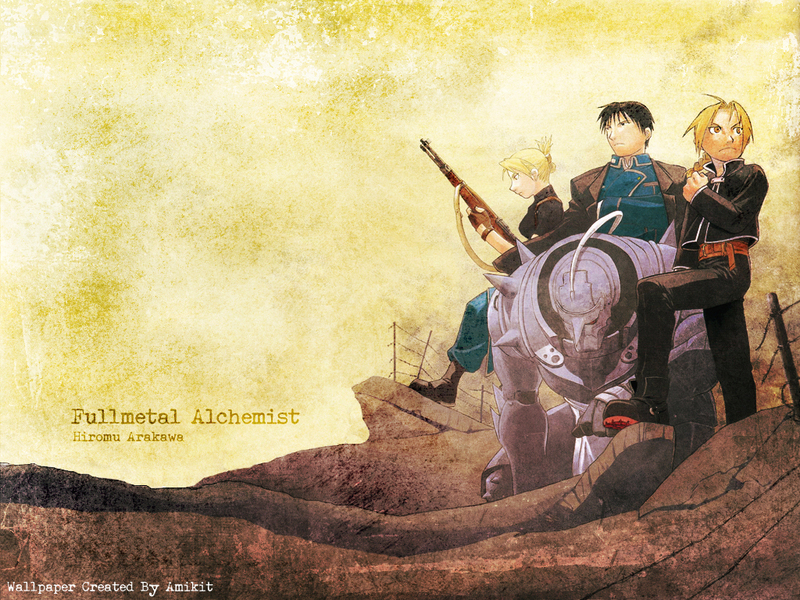 This wallpaper shows Edward Elric, Alphonse Elric, Roy Mustang and Riza Hawkeye (Fullmetal Alchemist) stanging in a battlefield. The image (not mine) originally came from the Fullmetal Alchemist manga artbook. I made this wallpaper by extending the ground and sky by using the clone tool in Photoshop. Then I used downloaded custom brush tools and lots of filters to finish the job. That's some rough and dirty war wallpaper, just as it should be. Wow....love the sandy somewhat style in this, great work, plus it has Roy in it, wich is a definite plus for me. Very nice wall. I /love/ the texture, and the whole composition of it. Your work still awesome !!! Texture so plain but match with picture a lot.